A small Office Library can be fun, functional and beautiful. Ceiling beams, wainscoting, door and window casings… all in matched cherry, contribute to the very special nature of this room. Quarter-sawn sycamore was also utilized, for engagingly effective details. Employed with restraint and artfully integrated with the dominant species, natural sycamore punctuates the larger field of cherry. Related in color, but with a distinctive grain pattern, the sycamore gently highlights the cherry, introducing an element of the unexpected, as seen in the close-up image, # Int 6499.4. 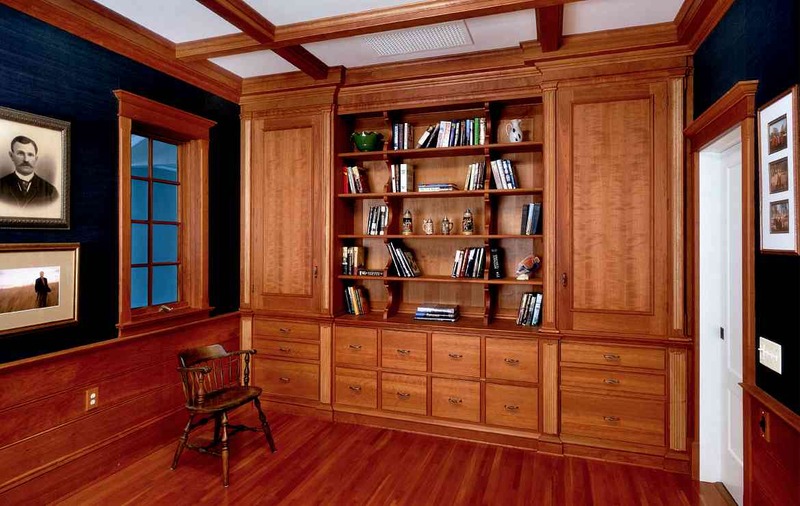 Only the custom cabinetmaker’s extensive experience with many different woods, allows such possibilities for a library, den, or home office. Explore the custom designed excellence of master craftsmanship. Discover the creative possibilities beyond the limitations of mass produced products.